I've somehow managed to resist the numerous member-only fashion websites (I like to try on clothes first, or at least have the option of returning them to a store if they don't fit me right), but I am in love with the new website, Design Story. They offer designer furniture, well-styled housewares and even gorgeous stationery--all at a discount. Some discounts are better than others, but most seem downright amazing. And sales seem to typically last just under one week. I was so happy to see that Egg Press was joining their ranks this week--I'm a huge fan of their cards and have gifted them for years. 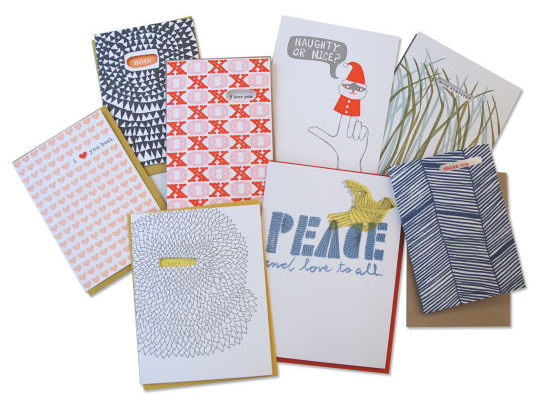 This grand collection of letterpress cards might be just what I need to get organized for the year. I love having pretty cards on hand--it's one less thing to worry about! As an added bonus, they will give us both a $10 Design Story credit if you sign up. Talk about super nice! And even if you don't want to sign up, it's fun to peek at the website just for a "shot of pretty". Having a variety of cards on hand is absolutely one of my favorite time-saving tips--it's so nice to just select a card I already love at home versus frantically picking one up at Walgreen's on the way to whatever event is happening. I loved what you’ve done here. The design is elegant, your content classy. Yet, you’ve got edginess to what you’re offering here. Ill definitely come back for more if you keep this up. Don’t lose hope if not too many people see your vision, know you’ve got a fan right here who values what you’ve got to say and the way you’ve presented yourself. Good on you! Ohhhh I love this! Thank sos much for sharing. This is really a nice picture I like it very much and your post is very interesting and I really enjoyed to read this post.Thank you for sharing with us. Alison, you are sweet to be concerned. Thank you! I think it's linked, but if it's not, oh well.